As you all seemed to have liked our previous first impressions post, we decided to take you on another quick trip down to Sephora with us! 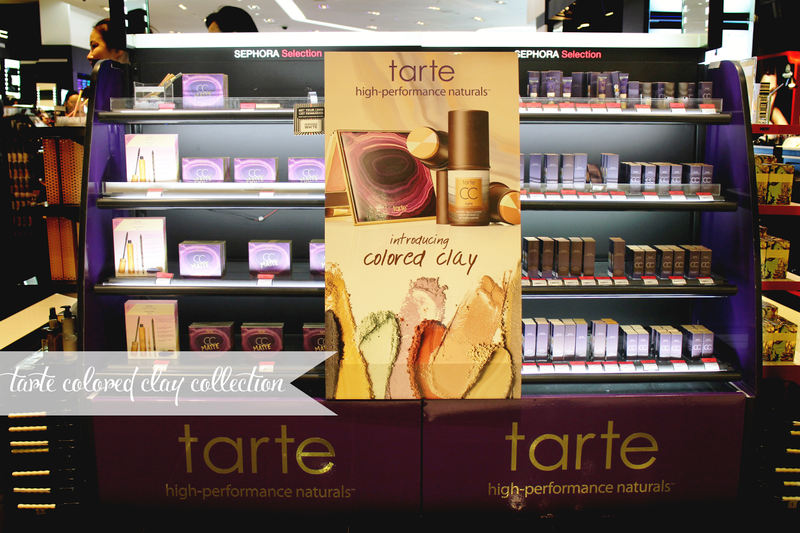 Tarte just launched their Spring 2014 Colored Clay collection at the Sephora's here in Singapore just a couple days ago and seeing as we both adore the two tarte products that we currently have at hand, we knew we just had to check it out. 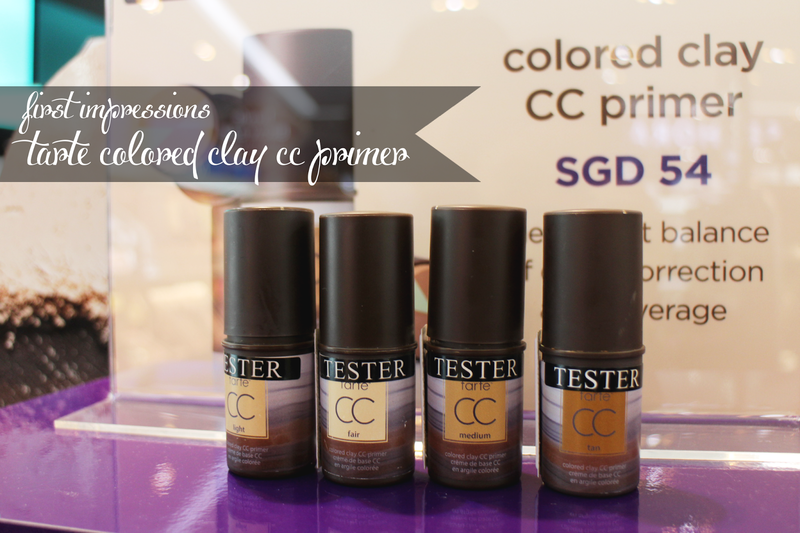 Ps: There are a quite a number of products to the new collection, but we will only be doing quick overview on the Colored Clay CC primers because CC creams are fairly new in the market and we thought Tarte did a rather interesting take of it. Here's a quick overview at the display as soon as you head straight for the Sephora at ION. They've got the Maracuja Concealers (SG$39), the Amazon CC clay matte palette which is a beautiful palette with a light bronzer along with a couple of taupe and neutral matte eye shadows (SG$69) and of course, lets not forget the Colored Clay CC pirmer! 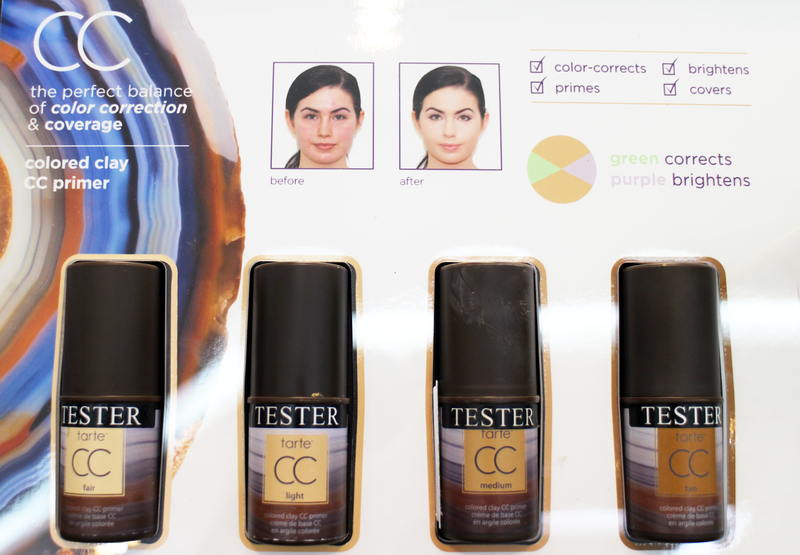 Thanks to the antioxidant-rice formula (includes, Amazonian color, Pomegranate, Acai, vitamin E and mineral pigments) , the Colored Clay CC primer provides, the CC primer sets out to even skin tone, texture, make your skin appear smoother and softer and even! Reduce the size of your pores whilst providing colour correction! Hold up. I'm sorry. does this not sound like a little bit of miracle product to you already? Buff your way to complexion perfection with this revolutionary correcting stick. Infused with Tarte's new color-correcting Amazonian colored clay, this powerful, skinvigorating™ primer blends easily to help brighten skin, even skintone, blur imperfections, and neutralize redness and discoloration. Use this multitasking corrector before foundation as a color-correcting primer or alone as light coverage for an allover flawless look. Its antioxidant-rich formula delivers the perfect balance of color correction and coverage with a soft, matte finish. Being design students and a girl, we are often drawn to a product first and foremost through its packaging. Unlike most CC creams, this primer is packaged much like the Benefit Stay Flawless 15-hour primer as opposed to being in a pump or a tube. Once the plastic cap is removed, the product comes out through a twist-up mechanism, which makes it easy for quick application on the go. I know... I know, you hygiene conscious people out there might not find this as appealing, but you can definitely always give the stick a wipe on a tissue right after use in fear of any bacteria lingering on the product overtime! 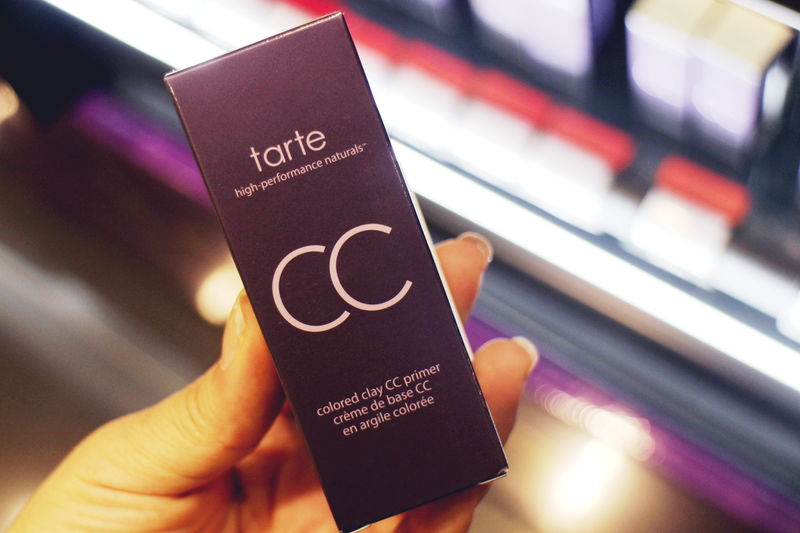 What makes this CC primer so special is that it not only gives you the coverage that you need but conceals redness and brightens at the same time! Who doesn't want to get ready a little quicker in the morning? I know I'd like to have one product that does it all... Check out the photo of the model in the before and after shot too! that's pretty amazing as it is! It is recommended that the product be applied directly onto your skin to get the most out of the product. The method you choose to blend the product out is entirely up to you! You can either buff it into your skin with your faovourite buffing brush or with your finger tips! 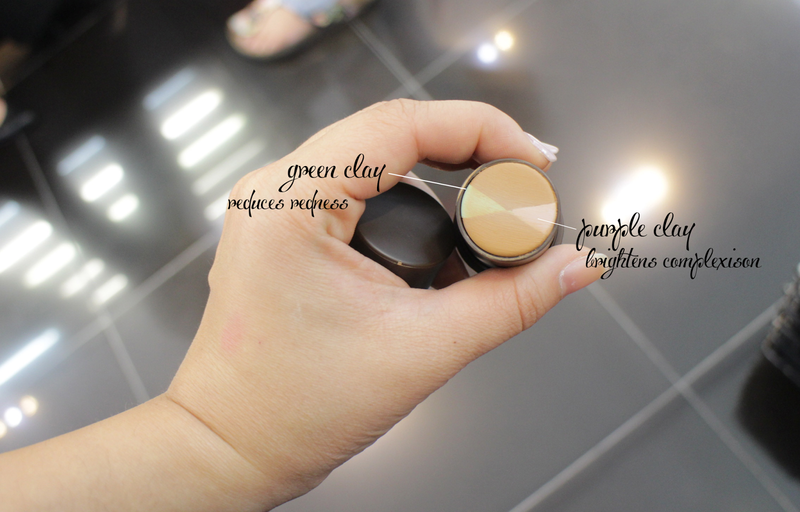 Personally whilst trying this product out, we felt that even with our finger tips, it gave really natural and smooth coverage without any of the green/ purple pigments showing at all ! They all blend to create a perfect canvas on your face! 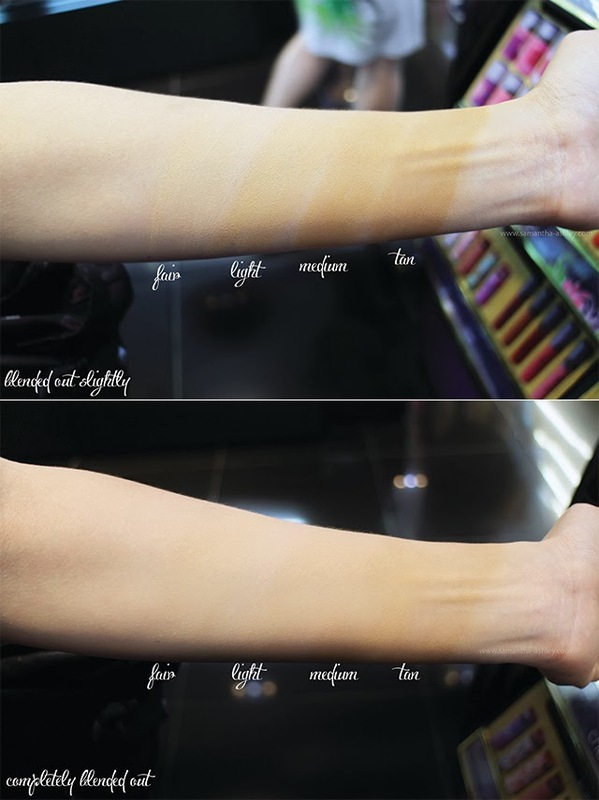 The product has a velvety-powdery finish and is (being a clay) very matte on the skin. Nothing that looks scary or unrealistic at all. The purple clay helps brighten your complexion which helps give it an incredibly natural finish. The coverage and finish is absolutely perfect for Singapore's humid weather. Once applied onto the skin you can tell where the pigments of the individual coloured clay lies, the colour itself is really pigmented, and doesn't flake or fade off into nothing once blended out completely as you will see! Blending in was the part where Sam and I were just in awe, it didn't take much effort to blend the product in with our fingertips and the coverage itself is beautiful and oh-so natural! 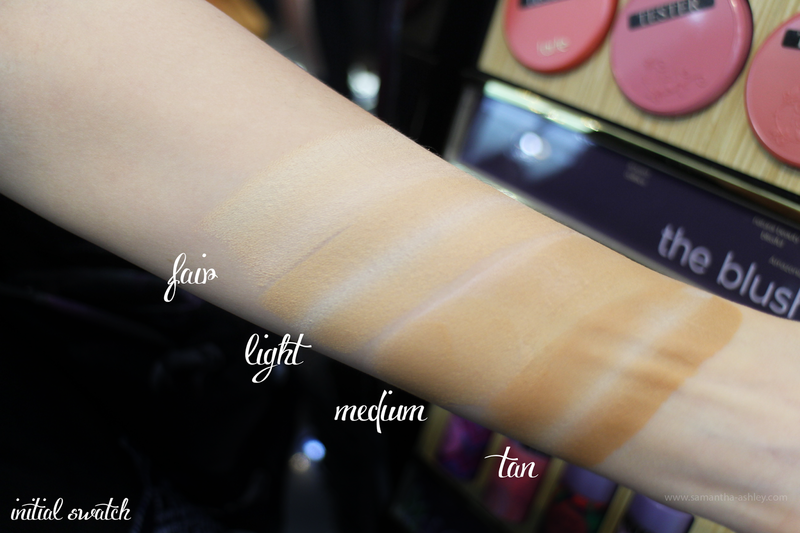 As you can see, none of the pigments are too overpowering, they all come together into a beautiful blend to enhance your skin tone to give you a brighter complexion! After all, the slogan for Tarte's Spring 2014 collection is "To Brighter days!. 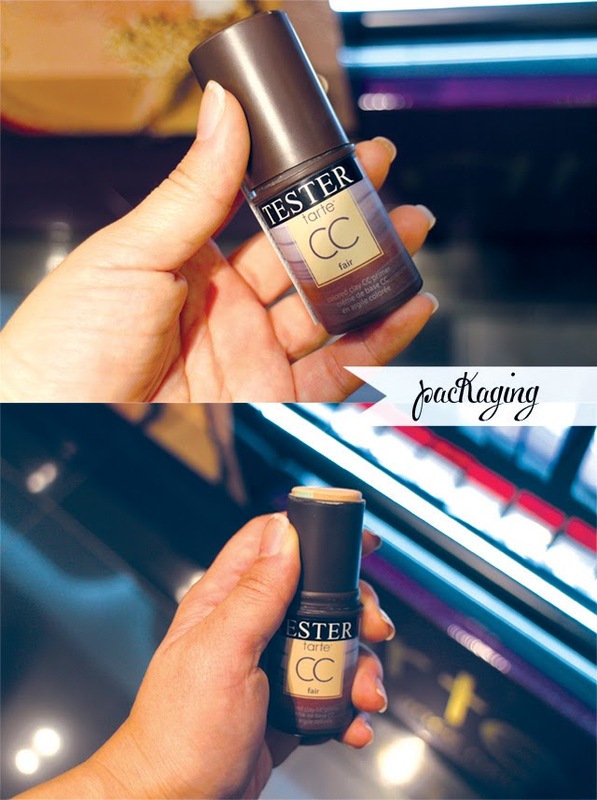 We were also saying how the CC primer in tan can even double up as a lovely matte bronzing stick! It's definitely an innovative and interesting invention from Tarte, the coverage is amazing, there's almost no scent to the product and with all the given benefits mentioned throughout the post (evens out skin's texture and skin tone, reduces the size of pores, makes skin smoother and softer) I might have made an impluse buy that day had I not got the Tarte BB Cream a month and a half ago! Do let us know if you've given this product a try or are thinking of getting it in the comments! Can't wait to try this! Thanks for the swatches - that was awesome of you to do. Thanks for the swatches! was waiting for these to come out! Can I ask about Tarte cosmetics price ? How much for their new lipsticks line, the Power pigment and the old Butter lipsticks? And could I ask a question, which is not much related to this topic, is there any place in Singapore that sells Bite Beauty products. I've been wandering the web for a while and cannot find the place.